1. In addition to today being smack-dab in the middle of a 19 day event known as Art-Prize (an urban, open art festival /contest where what the people think matters most) today marks the start of “Pulaski Days!” Celebrating Polish heritage, this is a weekend-long event of kielbasa, pierogies, holubchi (cabbage rolls), beer and of course, lots and lots of Polkas. Tonight we’ll meet up with friends at one of the Polish halls and eat, laugh and, of course, get our Polka on! I’ll check out the “art” next week – or not. 2. Took a road trip to points north Wednesday. My meeting started early afternoon so I had time to meet my Father-in-Law for lunch first. Arriving at a restaurant filled with Seniors, I spotted him at a table about as far from the door as you could sit. It was the seat you take when you don’t mind everyone knowing you have yourself a lunch date. It’s also the kind of place where people like to linger because the food is good, the wait staff is friendly and nearly everyone gets called “Honey” or “Sweetie,'” at least once. We enjoyed a tasty meal and meandering conversations and I couldn’t help but think of her, my late Mother-in-Law, and how much she’d have loved that moment. 3. On Facebook, have you ever noticed that friends & family share recipes of really yummy/naughty foods … at night? Sometimes my morning FB feed is filled up with cheese bread, caramel cake and pie recipes. Right after the posts on workouts. Hmmm. 4. Speaking of workouts, I think I own most of them. I get bored easily. There was a time I was running, but then my knees started hurting. Then came yoga, which I still like, but have never mastered. Walking bores me and Zumba … well that’s just an epic fail. The only program I’ve stuck with is this one: Kettleworx. I found it in the clearance rack (that could have been a sign …) and gave it a go. I started with the smallest weight and worked up. The instructor is corny and the editing isn’t great, but it’s a 20 minute weights workout with a slow-enough pace that I can actually .. f-o-l-l-o-w along. And you know what? It’s working. I am stronger – noticeably so – and my clothes are looser. Hmmm. 5. And finally, I have made no secret of the fact that I’m a list maker. Always have a list. Yes I never find money in a winter coat pocket .. I find a list. And this little saying here hits way too close to home.You? The county fair is weekend after next. Rick wants to take pictures of the lights so I guess that means we’ll be going on a date at night. ♥ Myron’s “Shall We Dance?” has me thinking there may be dancing too in the old German hall at the center of the fairgrounds. We are German and enjoy the same foods as the Polish folks. Pierogies are to die for! The video of the Lawrence Welk show made me homesick for my parents. My Dad played the accordion and he loved the “Beer Barrel Polka.” It was fast and lively but he always sang “Blue Skirt Waltz” to me. *sniff sniff* Good times. Thanks for the journey down memory lane. And for heaven’s sakes, I can’t remember what I had for lunch yesterday let alone a phone number! It’s pretty hard to go wrong with Pierogies 🙂 I bought 2 sampler plates – one for the guys and one for us girls — each plate contained a cabbage roll the size of my fist, 3 pierogies, kielbasa & sourkraut + your choice of German potato salad (yes!) or Mashed potatoes & gravy. I grabbed 4 forks for each plate and set them down — the guys went back for plate 2, we girls sampled all and there was still food leftover! Doggone it! Now I’m hungry for ethnic food. We are lucky to have an Austrian restaurant (with genuine immigrant cooks) about a half hour away with fabulous helupkies (cabbage rolls). The also have those wonderful crepes with cottage cheese inside and a splash of jam on the outside. Their chicken paprikash is to die. I love that you have a lunch date with your father-in-law…. As much as me and my brothers protested watching Lawrence Welk (we didn’t have to watch it but on Saturday nights that were the channel was tuned) I rarely missed an opportunity to watch, especially the Christmas Show where they trotted out the families of the band and singers. Great memories, thanks for the video. How about you? Have you ever danced a Polka? Never mastered the Polka, which is a shame since I’m half Polish! Any cool doings in your town this weekend? None that I know of, so it’s a typical Saturday bowling night for us! Are you a late night recipe poster? I never post recipes, I just collect them. What’s your workout of choice? I’m really loving my runs, now that I’ve been doing them for four months and am feeling competent about them. However, it’s getting cold out, and the treadmill can get boring, so I just bought Jillian Michaels’ Kickboxing! HA! I hope you had a great weekend and fun time bowling ~ and I heard your favorite Polka song the other night – whee! You know how you’ve gotten over the death of a parent, and you’ve moved past the grieving stage, and then something totally reduces you to a puddle of tears? I never grew up listening to polkas, but every now and again my father would sing, “Idon’twantheryoucanhavehershestoofatforme.” He danced a wonderful waltz. I have no idea if he polka’d, but he probably could. Right now I miss him a lot. My workout of choice is doing yardwork with a chainsaw, and other tools. 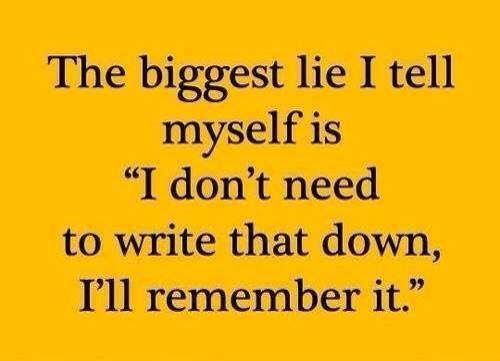 And if I want to remember anything I have to write it down. Aww — well memory is a fickle thing – sometimes the oddest moment can bring forth a flood of them. My Dad was a wonderful dancer and loved to Polka so I learned with him. I miss him a lot and always when I hear certain types of dance-able songs. Thus, the list post, right?! I’m a list-maker, too! What can I say? So, yeah, I’ve been gone all summer. We moved across town but just got our internet two days ago–I kid you not! LONGGGGG STORY! Hope you had an awesome weekend, MJ! Yes – a list post tends to work well for a list-maker 🙂 ha – good catch!! Welcome back, it’s good to hear from you again Kathy. My aunt and uncle used to polka, and the menu sounds like dinner when I had the chance to eat with them. I like a mix of exercise–I have some videos with Leslie Sansone. She makes it easy to follow along. (In Home Walking) We got a treadmill this year, and I like that a lot (with my favorite music cranked up), also have a recumbent bike, which I hope to make more use of and get some reading done at the same time. Then there’s swimming at the rec center, and long walks at the botanical garden with my camera.